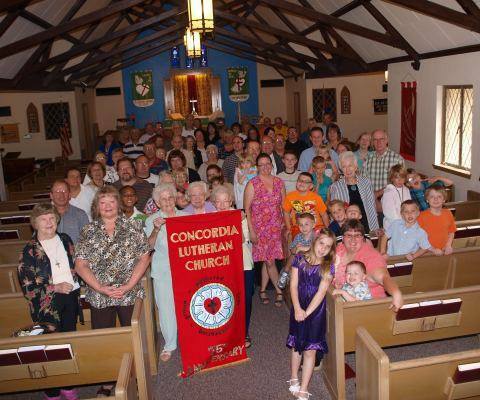 If you are a guest looking at this page for some evidence that Concordia Lutheran Church is a place where you will be comfortable, we can assure you that you will be welcomed with much enthusiasm, but you might also find yourself witnessing some things that you have never experienced before. In many ways we are not normal. A Christian worship service is not exactly routine. It isn't like anything you've probably experienced anywhere else. We "deal in reality" and are not concerned about sounding like everyone else. The Christian worldview is unique and we are eager to share it with you. We cannot promise that you might not be "caught off-guard" by what we do, but we can promise that in everything we do it is our sincere desire to point you to the grace of our Lord Jesus Christ. We hope that from the moment you walk through the door to the final benedicition you will have gotten a glimpse of the Divine. We really want to make a good impression. We really want you to want to come back, but more than anything we hope you will realize that you have been in the presence of God, who is eager to give each one of us the gifts that we desperately need.